The fundamental equations used to model the motion of a fluid are Euler's equations for an inviscid fluid or the Navier-Stokes equations for a viscous fluid. These can be formulated under a range of conditions, for instance in a rotating frame of reference, giving rise to a hierarchy of different equations under different balance conditions, each a valid approximate model under a range of realistic settings. Each of these sets of equations behaves somewhat differently, and understanding the fundamental mathematical properties of these different sets of equations can give insight into the mechanisms underlying the fluid flow being modelled. A solution to any set of these equations, representing a fluid flow may have a range of scales of motion. These scales must range from the largest scale available in a given domain, through to the smallest scale possible in the model (possibly dictated by the presence of viscosity). Typically these are considered in Fourier space (think of a Fourier series representing the solution), with large scales represented by low wavenumbers, and small scales by high wavenumbers. For a flow that starts out with a given scale of motion either as an initial condition or by forcing the flow at that scale, it is informative to consider the cascades (of conserved quantities) to other scales. Energy is the easiest quantity to consider. If energy is put into a flow at a certain scale, how does energy at other scales accumulate as they get excited? The cascades of energy, enstrophy (mean squared vorticity), 'potential vorticity' or various other meaningful fields might be of interest. Studying and understanding the cascades of different fields can give a key insight to the dynamics of a set of equations, and can tell us something about how far they depart from linear behaviour. We have been particularly interested in studying two-dimensional fluid flows and their geophysical extensions, including the effects of a magnetic field. Progress in three dimensions is notoriously difficult (see below), though we have made some small advances. In two dimensions, one interesting problem that we have unravelled is that the assumption of non-zero enstrophy dissipation in two-dimensional Navier-Stokes turbulence in the inviscid limit is inconsistent with the k-1 enstrophy spectrum deduced by Batchelor in 1969 using this assumption (see Tran & Dritschel 2006). 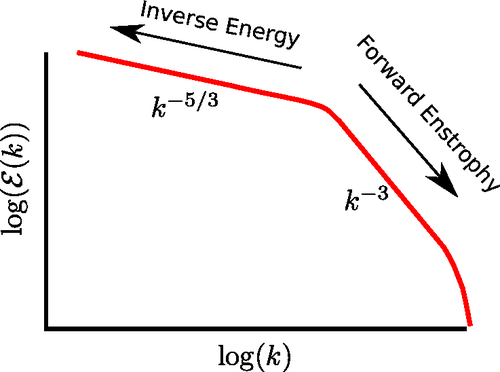 This non-dissipative cascade of enstrophy is a consequence of the global regularity of the two-dimensional Euler equations and is fundamentally different from the dissipative cascade of energy in three-dimensional flows. There is an open question concerning the three-dimensional Navier-Stokes equations (and other fluid systems, such as the magnetohydrodynamic and suface quasi-geostrophic equations) as to whether they possess solutions which become singular from well-defined 'smooth' initial conditions after a finite time. Such questions are at the heart of one of the Clay Institue Millenium problems. In problems of this type, understanding any of the possible conditions which might lead to 'blow-up' in the fluid dynamical system is basic to understanding the underlying system of equations, and in particular their range of validity.